Militants have fired at the positions of the Ukrainian Armed Forces 33 times over the past 24 hours, killing one Ukrainian serviceman and wounding three more, the press center of the headquarters of the Joint Forces Operation (JFO) has said. "Invaders opened fire on the positions of our troops 33 times. The enemy twice used weapons banned by the Minsk agreements. Four servicemen were injured in fighting, one of them died from severe wounds," the JFO HQ said in a report on its Facebook page early on Wednesday. 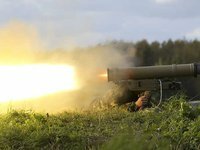 According to the report, illegal armed formations shelled Ukrainian positions near Stanytsia Luhanska, Krymske, Zolote, Katerynivka, Luhanske, Novoluhanske, Mayorsk, Shumy, Kamianka, Pisky, Maryinka, Starohnativka, Pavlopil, Hnutove, Vodiane, and Shyrokyne. "Since the beginning of the current day, the enemy has fired at the positions of the Joint Forces five times. Two cases of shelling were recorded in the Luhansk sector near Krymske, and the others in the Mariupol sector near the settlements of Hnutove and Vodiane," the press center said. According to Ukrainian intelligence, two militants were killed and five more were wounded over the past day.